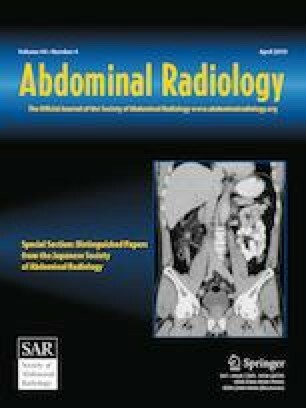 To evaluate correlation of “placental bulge sign” with myometrial invasion in placenta accreta spectrum (PAS) disorders. Placental bulge is defined as deviation of external uterine contour from expected plane caused by abnormal outward bulge of placental tissue. In this IRB-approved, retrospective study, all patients undergoing MRI for PAS disorders between March 2014 and 2018 were included. Patients who delivered elsewhere were excluded. Imaging was reviewed by 2 independent readers. Surgical pathology from Cesarean hysterectomy or pathology of the delivered placenta was used as reference standard. Fisher’s exact and kappa tests were used for statistical analysis. Sixty-one patients underwent MRI for PAS disorders. Two excluded patients delivered elsewhere. Placental bulge was present in 32 of 34 cases with myometrial invasion [True positive 32/34 = 94% (95% CI 0.80–0.99)]. Placental bulge was absent in 24 of 25 cases of normal placenta or placenta accreta without myometrial invasion [True negative = 24/25, 96% (95% CI 80–99.8%)]. Positive and negative predictive values were 97% and 96%, respectively. Placental bulge in conjunction with other findings of PAS disorder was 100% indicative of myometrial invasion (p < 0.01). Kappa value of 0.87 signified excellent inter-reader concordance. In 1 false positive, placenta itself was normal but the bulge was present. Surgical pathology revealed markedly thinned, fibrotic myometrium without accreta. One false-negative case was imaged at 16 weeks and may have been imaged too early. Placental bulge in conjunction with other findings of invasive placenta is 100% predictive of myometrial invasion. Using the bulge alone without other signs can lead to false-positive results.